Upgrade your TV audio to a premium experience with the VIZIO 38 2.1 Sound Bar System and Wireless Subwoofer, a great fit for 42 + Class TVs. 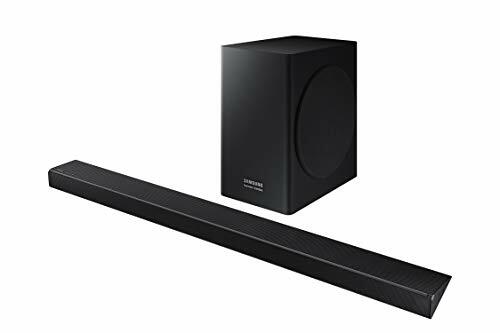 The Sound Bar system packs a punch with a wireless subwoofer and integrated Dolby and DTS audio technologies, delivering a room-filling audio experience with deep thumping bass all in a sophisticated new design. The built-in Bluetooth feature allows you to wirelessly stream music from your phone, tablet, or computer. With everything you need for a quick and easy setup, upgrading your TV audio to a home theater experience has never been easier. 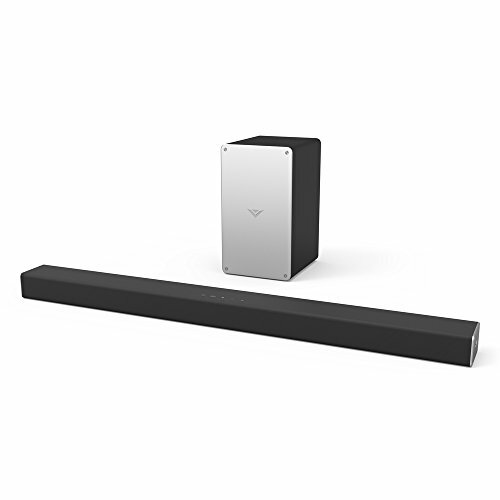 Introducing the all-new VIZIO 28 2.1 Sound Bar System. Easily upgrade your TV with a 2-channel sound bar plus subwoofer with crystal clear sound at levels up to 95 dB. Use Bluetooth to stream music from your smartphone, tablet or computer. 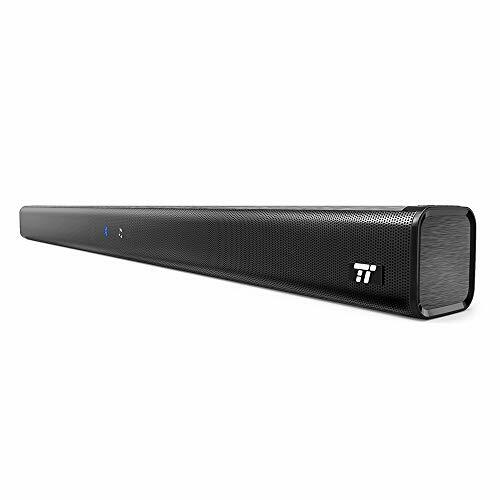 The Sound Bar features DTS TruVolume, which minimizes the distractions of fluctuating volume and DTS TruSurround for an immersive surround sound experience. With everything you need for a quick and easy setup, upgrading to an amazing home theater experience has never been easier plug the Sound Bar and subwoofer in, connect to your TV, sit back and enjoy. NOTE: Please refer to the user manual for before use and refer to pg.25 for Help & Troubleshooting. Complement your TV with theater-quality sound from your favorite movies, music, and games. This ultra-slim sound bar fits discreetly in front of your TV or on a shelf, or can be rotated for a low-profile wall mount. Setup is a breeze with a simple connection to your TV while Bluetooth lets you wirelessly stream from your mobile devices and Bluetooth-capable Amazon Alexa devices. 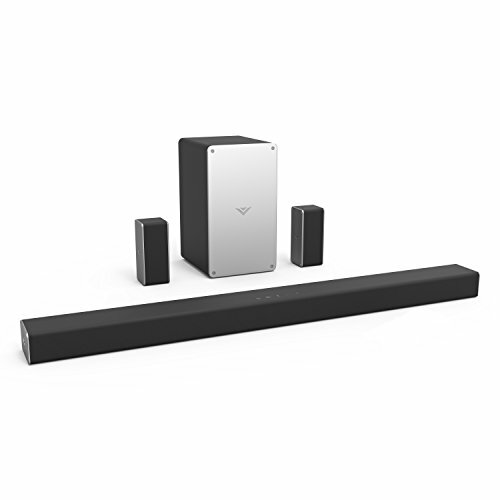 The VIZIO 5.1 Home theater sound system redefines how you experience sound. A three-channel sound bar boosts your TV audio and delivers crystal clear dialogue. The included wireless subwoofer adds booming bass, and the two rear surround sound speakers upgrades your home theater experience with true surround sound. With DTS Virtual: x built in, you ll swear there are speakers hidden in your ceiling. This innovative virtual-overhead sound technology simulates the effect of having sound rating down from above. 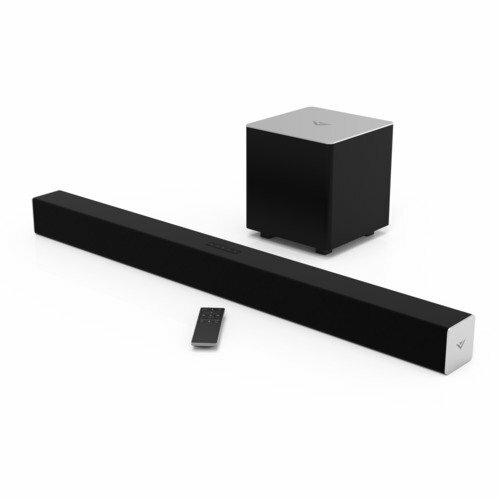 the sound bar system also connects you with your favorite music. Just use your smartphone to stream music from any Chromecast-enabled audio app, like iHeartRadio, Google Play Music, Pandora, Spotify and more. And streaming over Wi-Fi means the highest audio quality with no interruptions. Download the free VIZIO Smart Cast Mobile app and turn your mobile device into a powerful remote. This sound bar also works with the Google Assistant on devices like Google Home, so you can control your sound bar using just your voice! 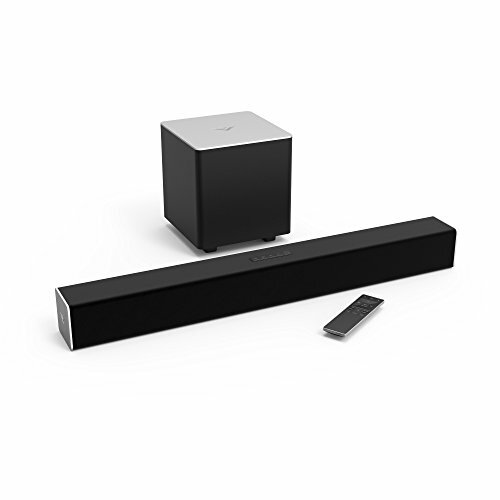 If you have multiple VIZIO sound bars and speakers, you can connect them together to stream music throughout your home. Enjoy the same song in unison or play different songs in different rooms. -3.5mm to 3.5mm audio cable -rca to 3.5mm audio cable -power cord for subwoofer -power cord for sound bar -wall mount brackets. TaoTronics - Enhance Your Life Enjoy life to the fullest with TaoTronics. From industry-leading LED lighting solutions to home goods and audio devices, we put users at the center of our decisions and design products that address life s needs and help you make the most of your daily activities. Style:Alto 7+ 2.1 channel w/ wireless sub Alto 7+ sound bar delivers distortion-free sound at any volume level and for any content. With dedicated components for left and right speakers, coupled with fine-tuning by experienced audio engineers, you will be able to hear every detail with crisp clarity. The arrangement of speaker channels consists of 1 tweeter and 1 full range driver on both sides. 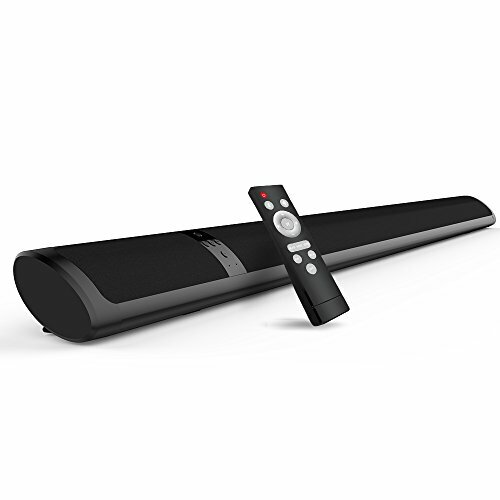 The sound bar also delivers unmatched sound in its class, without the hassle of complicated setup. A wireless subwoofer delivers extra bass to make movies and music content on your TV come to life. And because it s wireless, you can place the subwoofer virtually anywhere to adjust your exposure to bass. Whether you want to connect to your TV using an optical or audio cable (AUX /3. 5mm), all necessary cables are included in the accessory kit. Easily place the sound bar under your TV, or wall mount it with the included wall mounting kit to ensure you get it just right the first time. Alto 7+ comes with IR pass-through cable, allowing you to access your TV from TV remote, irrespective of sound bar placement. 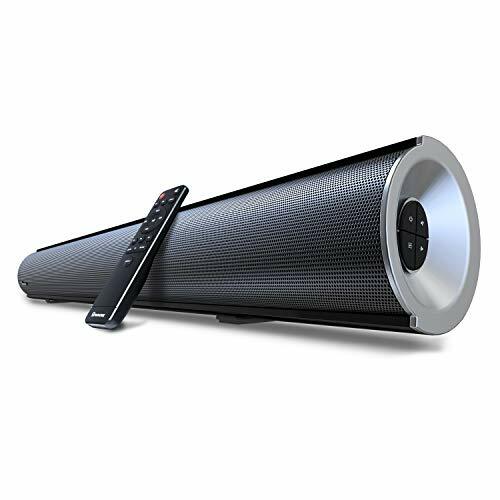 This sound bar is equipped with three different sound modes to deliver optimized sound for music, movies, and news. 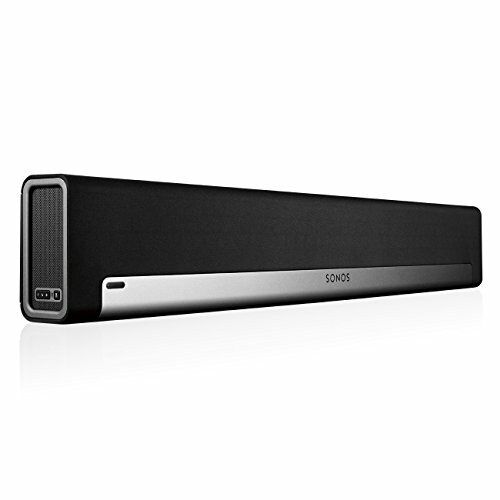 Sonos Playbar Sound Bar for TV to Wirelessly Stream from your TV or smart device. Works with Alexa. PLAYBAR s nine-speaker design floods your home with huge waves of epic, full-theater sound for TV, Web, Movies and Video Games. It is also a stand-alone all-in-one Sonos player that allows you to wirelessly stream all the music on earth-your iTunes library, your favorite music services, and thousands of Internet radio stations, shows and podcasts.PLAYBAR connects to your TV using a single optical cable and power cord and plays everything that is connected to your TV, from cable boxes to gaming consoles. Connect PLAYBAR or BRIDGE to your wireless router and link all Sonos players wirelessly with one touch. NOTE: To get started, you must wire either one player or BRIDGE to your home network using a standard Ethernet cable. 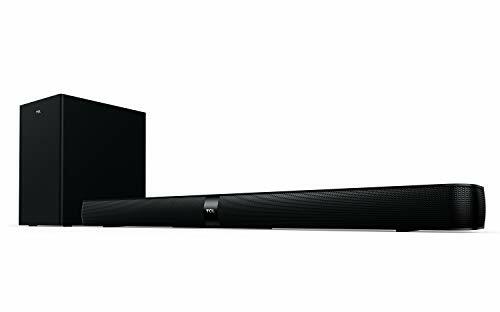 VIZIO s 38 2.0 Sound Bar with Integrated Deep Bass offers amazing audio with a sophisticated new design, a great fit for 42 + class TVs. Stereo full-range drivers paired with deep bass modules produces room-filling sound with added bass, while built-in Bluetooth allows you to stream audio from your devices. 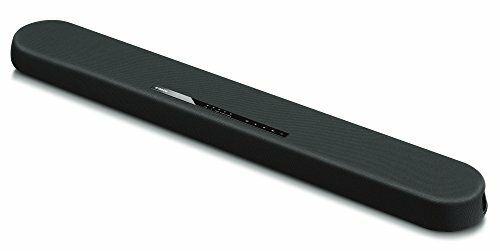 Wohome 2.1 channel wireless Bluetooth surround soundbar S28, 38-inch 80watts, output up to 105db of expansive audio, powerful bass and crystal-clear sound, compatible with the computer, projector, PSP,smartphones, almost all the TVs including Samsung/Vizio/TCL/LG/Ondia/Philips/Sony/Etc..
Sound+ Soundbars are simply beautiful. Samsung audio technologies deliver room-filling, home theater sound without the need for a separate subwoofer. Designed with streamlined wires and an elegant easy mount option, Sound+ becomes one with your TV and brings your entire cinematic experience together like never before. Note: If the unit doesn t receive an audio signal from the TV for 5 minutes, it will power down. This is not a functional issue. Note: If the unit doesn't receive an audio signal from the TV for 5 minutes, it will power down. This is not a functional issue. 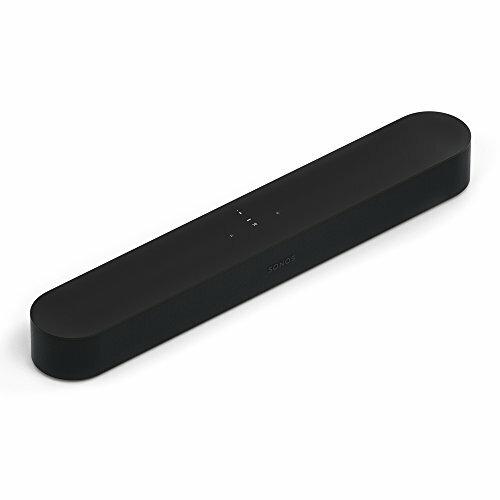 Alto 7 sound bar delivers distortion-free sound at any volume level and for any content. With dedicated components for left and right speakers, coupled with fine-tuning by experienced audio engineers, you will be able to hear every detail with crisp clarity. The arrangement of speaker channels consists of one tweeter and one full range driver on both sides. This set adds direction to sound as well as extra clarity because of added tweeter. The sound bar also delivers unmatched sound in its class, without the hassle of complicated setup. Whether you want to connect to your TV using an optical or audio cable (AUX /3. 5mm), all necessary cables are included in the accessory kit. Easily place the sound bar under your TV, or wall mount it with the included wall mounting kit to ensure you get it just right the first time. Alto 7 comes with IR pass-through cable, allowing you to access your TV from TV remote, irrespective of sound bar placement. 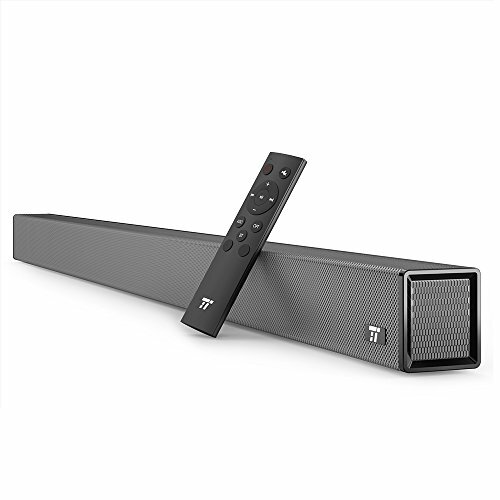 This sound bar is equipped with three different sound modes to deliver optimized sound for music, movies, and news. 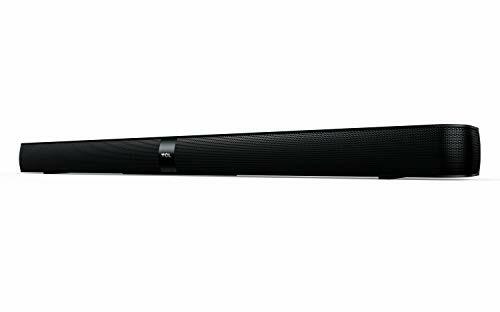 Meidong KY-3000 compact soundbar provides stellar sound for your favorite TV series, movies and music. It's slim, incomparably designed and extremely easy to use. The surround sound and double bass ports turn your TV sound into real cinema sound. The Bar includes Bluetooth connectivity so that you can stream your favorite music to the speaker, wirelessly. 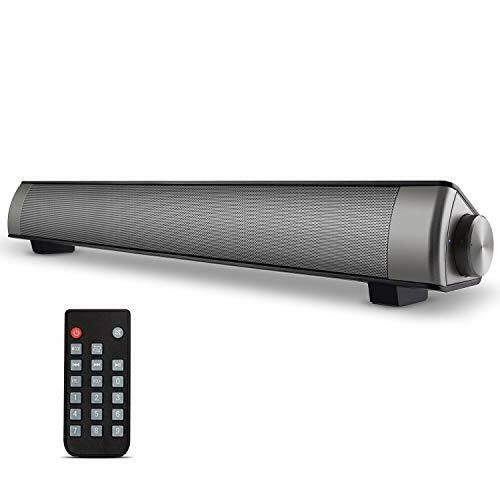 Bluetooth Function Available: Support devices with Bluetooth, Such as Smartphones, Computer, MP3/MP4 and TV.Powerful Stereo Speaker Enjoy the stereo booming sound with an high quality sound bar. Feel the real scene of your favorite movies, shows and sports with dramatic bass. Attention Please: When it be connected to your TV, a AUX Cable(3.5mm audio output) is needed. Before purchasing, PLEASE help to confirm that your TV or digital products do have 3.5mm AUX output or RCA output.NOTE: When connecting your TV First, you have to make sure your TV must be audio output Second, if the TV is an audio input, you need to take the lotus line In the end, you need to set the TV's sound as voice out loud. The Speaker supports Bluetooth Mode(Wireless connection range: 10M), TF card Mode.Line in(AUX,RCA) Mode. No HDMI interface. 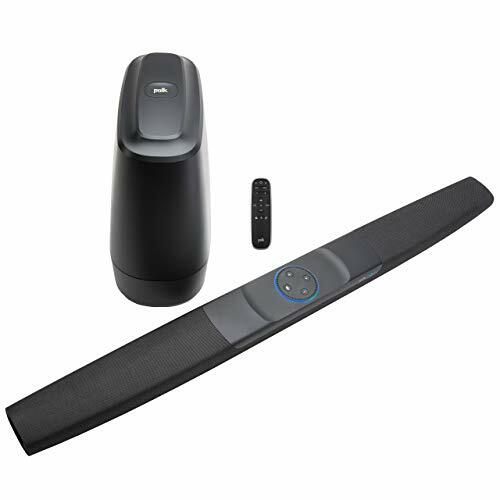 Compact home speaker soundbar system: Flexibly placing Fashion and portable design suits any home decoration. This TV speaker can perfectly sit flat below the TV screen or securely mount on the wall for a sleek and elegant home theater setup.Make you have a wonderful hearing experience, Enjoy your favorite Music, Movie. Relax your life! Buit-in rechargeable battery, Please charge it by USB cord .You can control the speaker by the button or using remote controller. With this two ways, you can use it more conveniently and quickly. Get into the action with panoramic sound. The Sound bar Q60R is the perfect audio match to your QLED TV. Immerse yourself in your favorite movies, music and TV shows, with directional sound that's perfectly synced with on-screen action.